The BPI announced that ‘album equivalent sales’ were up by 1.6% in volume terms in 2016, with vinyl and streaming identified as the key drivers. Many people retain a nostalgic soft spot for vinyl, so an apparently vinyl led revival is always going to get people’s attention. But not only is vinyl not the future (it was just 2.6% of sales in 2016), the big differences between the most popular vinyl, streaming, singles and album artists reveal just how fragmented the music business has become. Each of the top 10 charts (album sales, singles, top streaming artists, vinyl sales) almost reads as a standalone group of artists with remarkably little cross over. In fact, only 2 artists (the ubiquitous Drake and Justin Bieber) appear across streaming, singles and albums. None appear across all four charts. Two tribes: Only one of the top single artists of 2016 (Justin Bieber) was also a top album artist. This is why the album vs playlist album argument will continue way beyond 2017. Both realities co-exist with one catering more towards older audiences and the other to younger ones. The top 10 albums list is like browsing through a high street music store CD rack circa 2005: Elvis Presley, David Bowie (twice), Coldplay, Michael Ball. 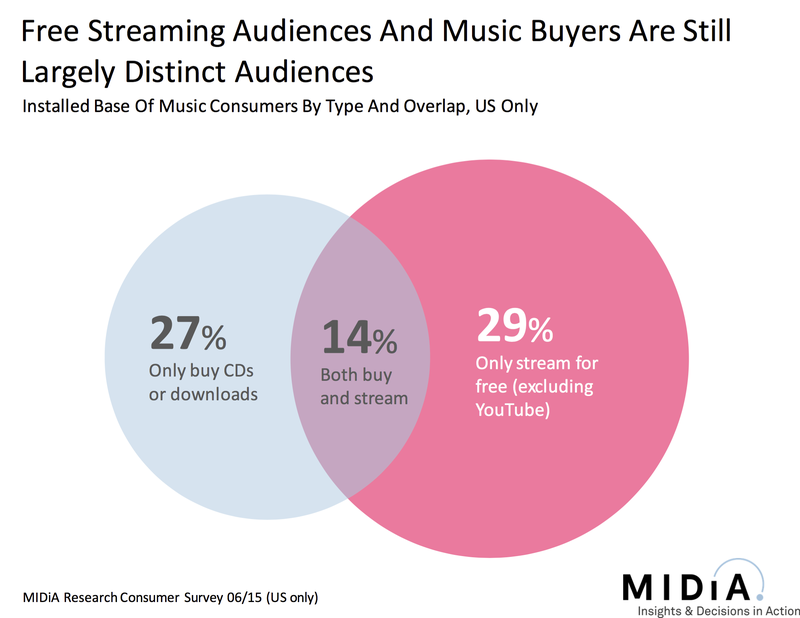 Of course, there is some overlap with streaming, an inescapable overlap considering that streams are now (for all the wrong reasons) counted towards album sales. Thus, we see contemporary artists Little Mix, Drake and Jess Glyn fill the 7,8 and 9 slots, while Justin Bieber is at #4. But first and foremost this is a tale of 2 tribes, 2 groups of music fans whose tastes and consumption patterns rarely overlap. Old format, old bands: Vinyl sales may have hit their highest level in the UK since 1991 but this is hardly a sign of what is to come. Indeed, a quick look through the top 10 vinyl albums of 2016 reveals that all but one of the artists were releasing music back in 1991! The exception is Amy Winehouse and she’s dead. The majority of the volume of vinyl sales is driven by nostalgic older music fans. Of course, younger people do buy vinyl too, but interestingly they generally do so as either a form of merch or as a way of supporting their favourite artist. In fact, many under 30’s vinyl buyers don’t even have turntables. The really important takeaway from all this though, is what it means for driving sales and marketing artists in 2017. One size stopped fitting all long ago, but now there are clearly two broad groups of music audiences which must be addressed in entirely different ways, across different channels and with different tactics. At the most base level this is a case of youth versus grey, of digital native versus digital immigrant, of playlist versus album, of sales versus consumption. But it is also more complex and nuanced than that. There are overlaps and cross pollination. They may be relatively thin on the ground right now, but like some long-lost treasure map, they may point to how bridges can be built across these two worlds. If no such links can be made then ultimately this will be a story of one world hurtling to oblivion while the other booms. That is of course the more likely scenario, highlighted by the fact that (in volume terms) UK CD sales fell by 12% and download sales by 26% in 2016 while streams were up 67%. The 2016 sales figures show us that the album in its traditional format still has a very solid, albeit quickly declining, audience. But if it is to outlive that dwindling customer base it must be rethought for the streaming era. Context: I spent a couple of years working in an Internet measurement company in the early 2000’s so I have some direct experience of measurement methodologies. If streaming is changing the music industry then it is only logical that the way in which the market is measured should change too. We are in a transition phase where consumers are abandoning ownership for access, and also often swapping spending for free. It is a period of uncertainty and there is an understandable clamour to make sense of it with new approaches to measurement. Hence Billboard’s decision to incorporate streams into its album charts (with 1,500 streams equalling one ‘sale’) and other moves such as the UK’s Official Charts Company’s incorporation of streaming. But it is not just the methodologies of the charts that are changing, their entire purpose is shifting. In fact, before we reinvent charts we need to be clear about what purpose we want them to serve. Driving sales: securing a high 1st week chart position dramatically increases the chances of more sales because it unlocks opportunities such as (more) radio play, TV coverage, retailer promotion etc. 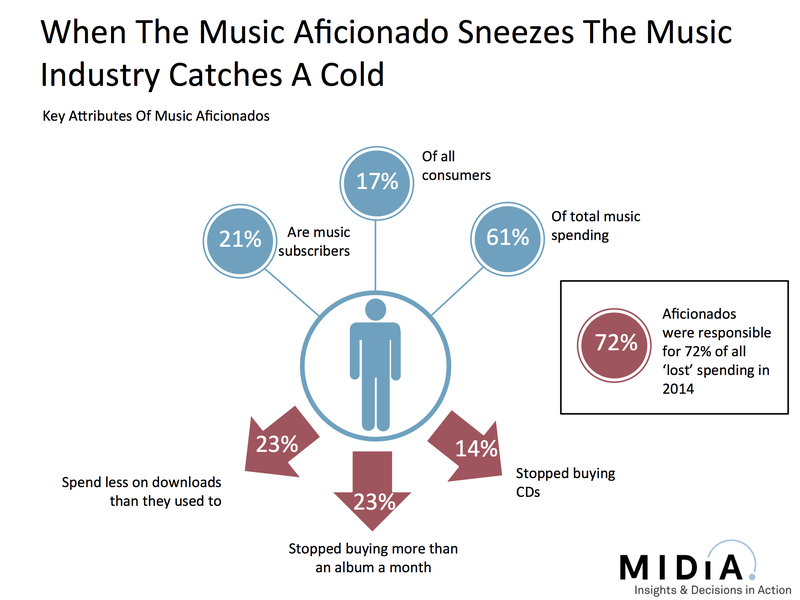 Driving awareness: by being in the charts music gets in front of consumers which matters because they typically exhibit herd like behaviour. Chart success can beget chart success. Adding downloads was a very natural and entirely logical step for charts. Downloads after all are still a sale. So all of the objectives remained intact. But adding streaming changes things. You might be able to make a direct revenue comparison with sales (i.e. 1,500 streams = 1 sale) but that obscures a much more diverse consumption picture. 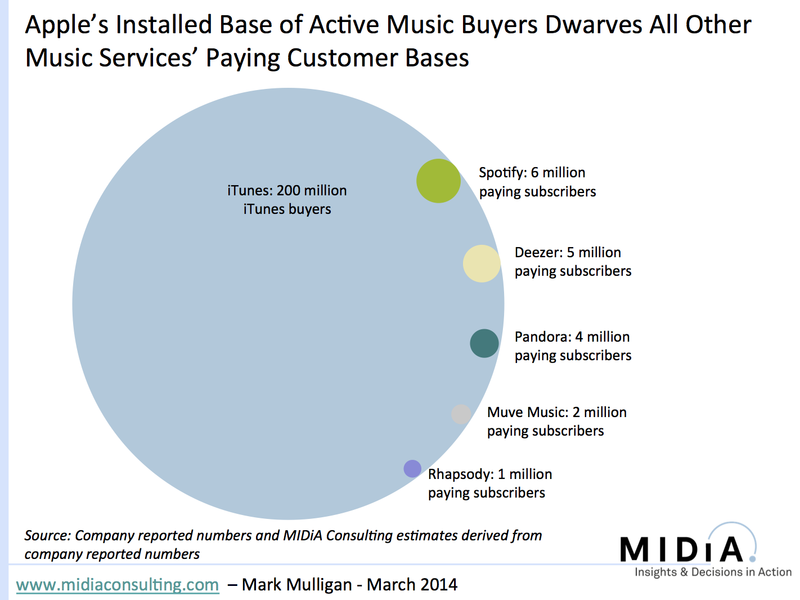 The simple fact is that many streams are not a sales equivalent. A subscriber listening to an album a few times through on a paid streaming tier can reasonably be considered analogous to an album purchase (in entirety in behavioural terms and in fraction in revenue terms). But a YouTube user that listens to a handful of tracks from an album just once cannot reasonably be considered anything like an album sale. Instead this is far more analogous to radio listening. 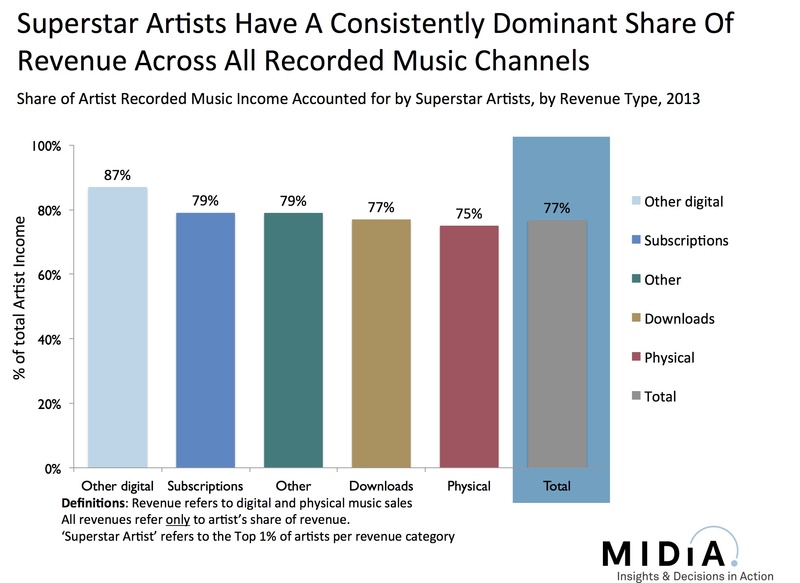 Using a revenue determined measure to define the link between streaming and sales changes the nature of a chart and in turn also what purposes it serves best. It becomes something that sits between sales and audience measurement. And, done carefully, that can be OK, but this needs to be recognized. 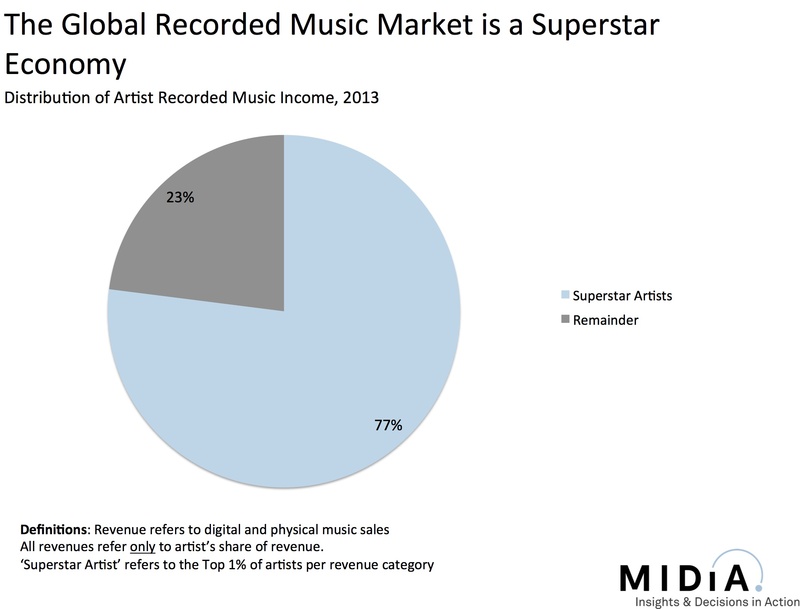 A chart that includes free streams cannot though be considered a sales chart. Capturing streaming activity is crucial but the issues are where and how. Radio play charts are a fantastic tool and help identify taste trends. This is where free streaming data most naturally sits, along with other inputs such as Shazams and also social data captured by the likes of Next Big Sound and musicmetric. 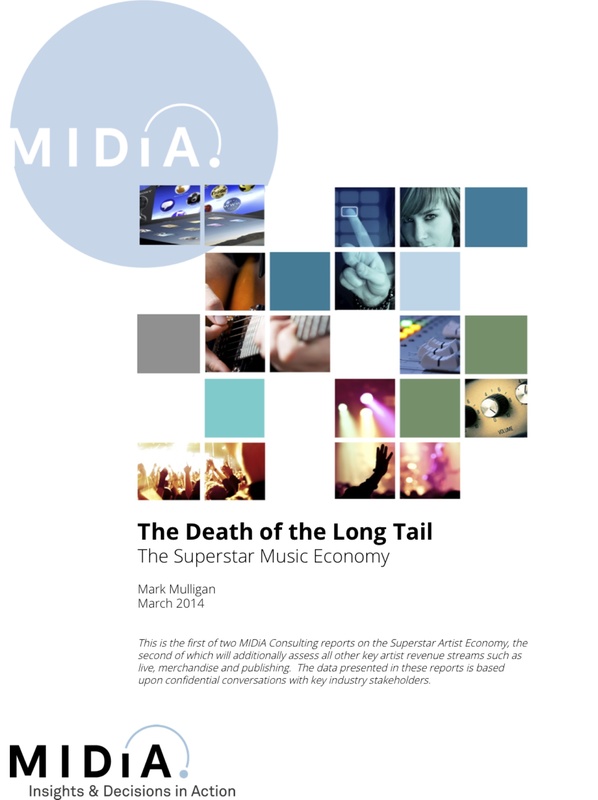 In this increasingly complex consumption landscape a broad range of inputs are needed to paint an accurate measure of music fan interest and behaviour. But try to do that simultaneously with measuring sales and you end up with a diluted mish mash that does not do either job properly.